Oil Filter Location on 1983 Yamaha Virago 750, 750 Midnight and 920 models. I do not know if Ben is referring to the Virago XV750 or the Virago XV920. They were both produced in 1983. The engines are very similar so the answer is the same either way. The oil filter is a paper cartridge type, located under the oil filter cover on the lower right hand side of the engine. Look for a small, round engine cover with 3 hex head or allen head bolts. 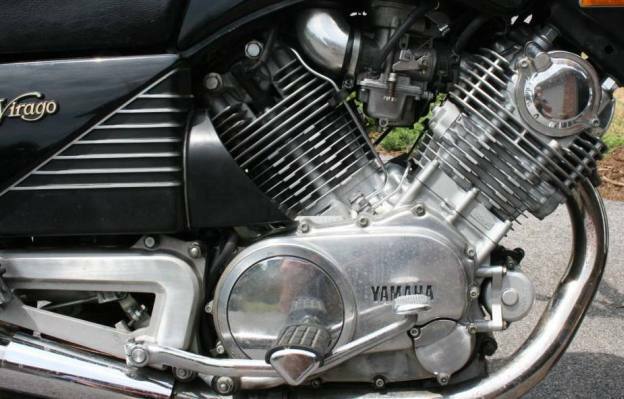 The photo below is of a 1983 XV750 Virago 750. You can see the filter cover below the HA in Yamaha. Do you have a question for Weeks Motorcycle? Are you tired of forums where a bunch of yahoos give you conflicting answers? Use the form below to ask your question. Please be as specific as possible. The boxes may look small but you can enter lots of info, the boxes will scroll.